Love and the fear of loss often go together. The other night before bedtime, my older son spoke to me tearfully about an alarming thought: he’d imagined me and my wife leaving to go somewhere—and never returning. Cuddling up with him, I felt his terror and his grief. Embracing my son with my arms and my heart, I validated how distressing that image must have been—because I know how deeply he loves us, and how much we need each other. Lying there in the dark room, I held my dear son and soothed him until his fears relaxed into love and trust. In a similar way, as my faith grows and changes, I feel the sadness and fear of some who love me in my faith community. Understandably, they fear losing something that we’ve shared and cherished—a bond of love and the hope of being together forever. In moments of fear or insecurity, the changes in my faith can feel to them like a rejection of those bonds, an existential threat to our deepest desires for lasting communion and connection. Just like my son’s imagined fears of losing his parents, my faith community’s fears of losing me (or people like me) can take on fathomless proportions; the depth of their fear and pain commensurate with the depth of their love. Like in any caring relationship, those who love me don’t want to lose me. They don’t want to lose common ground. Some fear that I might judge them. Some might wonder if I’m treating lightly sacred things, casually discarding things that I once held precious. Others fear for my salvation, and grieve for an imagined future of eternal separation. Others yet might judge or label me, but this particular post isn’t written for them. I’m writing this for those who still hope that we can see each other through the clear-eyed and hopeful gaze of love. For those of us who desire eyes of love to see, may we see. More deeply than you know, I’ve grieved and feared as well. The changes I’ve experienced in my spiritual life have turned me inside out over the past several years. And although I’m coming through my fears and changes to a deeper faith and trust, I know that some of you are still afraid and still in pain. So, in the same spirit in which I responded to my son’s nighttime terror, I hope what I share hereafter can wrap you in arms of love and reassurance. The church has nurtured in me a lifelong love of learning, and a curiosity about all the things I have yet to discover. I continue to hold beliefs about an open canon and open heavens—that God can’t be confined only to what has been written or understood before. I have so much to learn, and God has so much more to teach me. With you, I celebrate a theology that sees the divine nature and potential within humankind, while recognizing our clear need for each other and for God. I cherish the idea of an intimate God, and I love the examples in early church history of removing institutional intermediaries between ourselves and the Divine. I hold dear the church’s teachings about God’s love and inclusivity. The only theology that can work for me is one broad enough to embrace all of humankind, and one that removes us from the position of judging others. With you, I dream and work toward creating a Zion community; a place where all are welcome, all are cared for, and where we give particular care to the poor, the marginalized, and the dispossessed. I share with you the yearning for that special wholeness that we can only create together with others of God’s children. I still cherish our profound interconnectedness and feel deeply the importance of nurturing healthy relationships. With you, I am a fellow grateful recipient of love, grace, and forgiveness that I have not earned. Like you, I remain committed to wholesome, joyous, and generous living. I love the ideal of creating a place in the church where every name is known, and every person is valued (although I think we have a lot of room for growth here, especially regarding our LGBT brothers and sisters). The church has nurtured in me reverence for eternity, and a sense of wonder at recognizing that we are eternal beings, with this life as just one part of an ongoing existence (even though I don’t profess any certainty as to how that all works). Beyond all of these precious gifts from my life in the church, I carry within me a thousand memories of kindness, love, and learning that I may not have had otherwise (though there is so much good in other places as well). Let’s not lose each other to judgement or fear. I do not judge those whose faith looks the same now as mine once did; I just feel called to respond to God’s personal call to me. Jesus once taught, “The kingdom of God is within you.” I’m learning how to honor that truth; I’m learning how to trust more deeply the still, small voice that speaks within me. As I do so, I feel vibrantly the fruits of following that spirit: love, joy, peace, gentleness, goodness, faith. And let’s still move forward in faith and hope, even if we no longer share perfectly uniform beliefs. If you don’t share my particular interpretations about spirituality, then let’s both place our trust in God’s infinite goodness, compassion, and faithfulness. Let’s honor that we’re all probably doing the best we can, and that God is perfectly capable of saving His (and Her!) own creation. I will acknowledge that if I bear the beautiful marks of the church in my life, I also bear some scars. Perhaps these are inevitable in any immersive community. Someday, if you’re interested (and if it won’t hurt you too much, if you’re in a place where you can openly listen), I’ll tell you about them. But for now, I rest in gratitude for all of the beauty and goodness that we’ve shared. If we remain committed to love and listening, we don’t have to lose each other, even as we change. ~ If you are longing for connection with one who fears your changing (or with someone whose changes frighten you), and if you sense that this message could help, feel free to share by clicking one of the buttons below! Thank you so much for sharing this. It is exactly what we needed. This is a gift to read today, Paul. My heart relaxes and trusts as I feel your own heart through this writing. I love how carefully you point out the pain many of us feel in community right now, while also opening up new possibilities for remaining connected. Sending the love you offer so freely back to you. Beautiful, Paul. This is just beautiful. Thank you for sharing such a thoughtful post. p.s. I still consider myself Mormon/LDS, but that looks different for me than it once did. 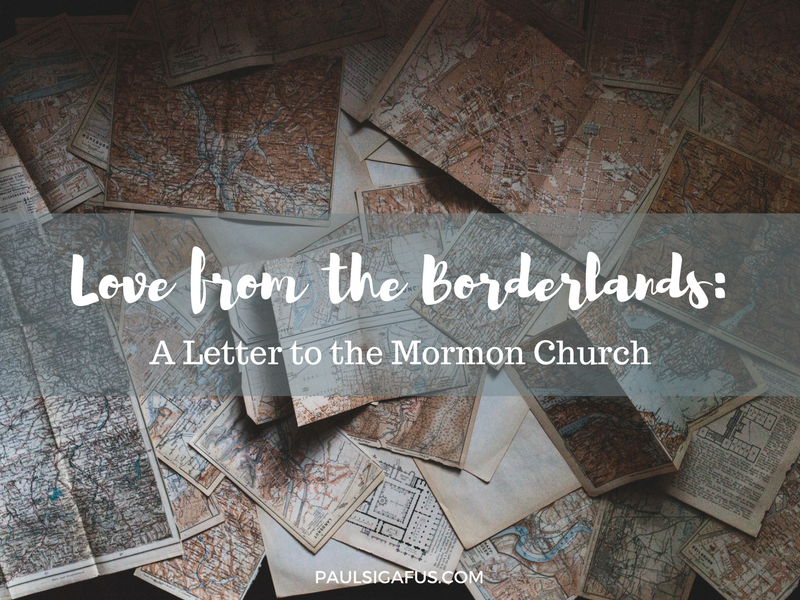 Thus the “From the Borderlands” in the title :) I can’t quite determine if I’m on the “edge of inside” or the “edge of outside” — but wherever I am, I remain deeply committed to engaging positively with Mormonism. I’m owning the title, even though it might not fit what others expect. How lovely is THIS morning with radiant beams from Heaven above bringing your message of your inner peace and love. It is good to know where you are now. We love you with our old love and our new love – forever. Great post! We will have to catch up sometime. I went through my faith transition 10 years ago. Thank you Paul! I reposted this Beautiful composition on Facebook because it expresses so perfectly my sentiments. I have wondered how I would help my friends and family understand my shifting beliefs. This is just what I needed! Beautiful post, Paul! I confess to tearing up a little at ” I carry within me a thousand memories of kindness, love, and learning that I may not have had otherwise.” That’s how I feel about my friendship with you and Carly. You have both picked me up so many times. I have learned (and no doubt will continue to learn) so much from your upstanding conduct and Christlike love. Godspeed on your journey. Beautifully expressed. I hope it is well received . You might want to change the spelling of cannon to canon, unless you really mean weapon.